As promised, I’m so excited to share with you guys this amazing video we crafted around our Ocean’s 4 inspired shoot (you can read more about the backstory here). 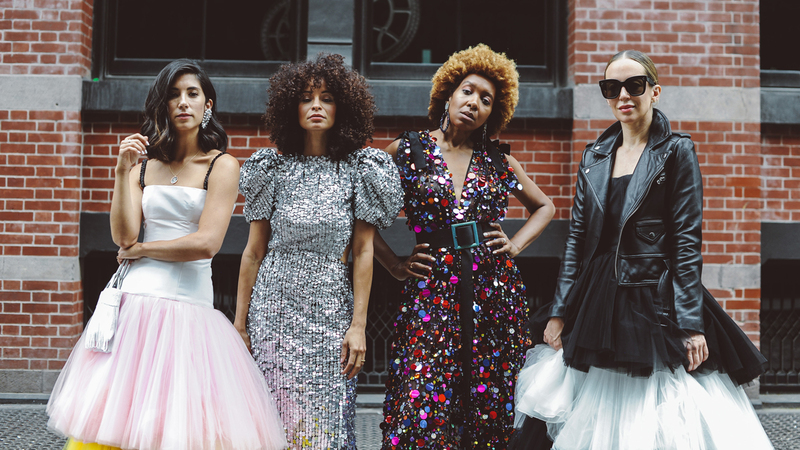 Not only was it a dream to shoot something so creative and editorial in Carolina Herrera gowns around New York, but getting to work alongside these ladies, whom I’ve admired for years now and am lucky enough to call friends — well, it made the day that much more special to me. Recently, I’ve been thinking a lot about this influencer/content creator/blogger (we need a better catch all name here) space I find myself in and more specifically, I think a lot about the content I both create and consume — and what motivates me on both fronts to do either. Personally, I think we can all agree this space is extremely saturated and I don’t say that with a heavy heart — I think it’s amazing so many men and women have been able to make their livelihoods and careers out of such a democratic space as this. But it also means there’s that much more content to digest. To scroll through. To like. To comment. To watch. And if I’m being more honest, I wonder how much I actually STOP to appreciate what is being created, because of the daunting amount of content at my fingertips. To put it lightly, it’s overwhelming — perhaps you feel the same? And I completely understand this works the other way too: how much do people pause to actually appreciate the content I’m creating and producing? They say you have 2 seconds to grab someone’s attention on any social media platform, and I’m sure by the time I’ve written that sentence, it’s changed to 1.5 or less. So how am I grabbing you in those 2 seconds? I’m not sure of that answer. In a space that’s constantly changing and growing, I’ve realized I’ve always been happiest when I’m bringing a vision for a shoot to life — for the sponsored shoots, yes, but even more so for the editorial, non-sponsored, I’m-just-dressing-up-with-my-girlfriends-for-the-fun-of-it shoots. Those are the ones that reawaken why I do what I do: purely for the joy of creating and sharing a world with you all, and I hope that joy comes through here. Sai, Karen, Helena and I are looking to make this a series moving forward — so please let me know if you have any ideas for the next shoot! We’re brainstorming now! In the meantime, HIT PLAY below! Style and boss babes, carolina herrera, editorial, new york city, nyc, oceans four, style. OMG I soooo love this!! I love the content you create (all 4 of you!). Always inspiring. And this video is so badass! I am deceased! You ladies are all so incredible – love following all of you. Also YOU ALL HAVE DAMN POWER STRUTS. YAS! Cannot wait to see more of your creativity! That was RAD!! I can’t wait for the next one! You four are so cooooooo!! I cannot wait for another one,,,very cool, love them very much. This is so fun and fresh! Love it!